Alan Turing is one of my biggest fans, er..., that may have come out the wrong way around. There are many accounts of his life and work, and in every one of them the genius clearly shines through. It's not just that he worked brilliantly on things like computability and the development of the first electronic computers, but also that as early as the 1930's he was already starting to think in ways we're still developing today. Such is Turing's legacy that his name features in several bits of common computer science terminology still in common usage, and some of them come up in the poem below. However the one that says the most doesn't feature. This is is "Turing complete". 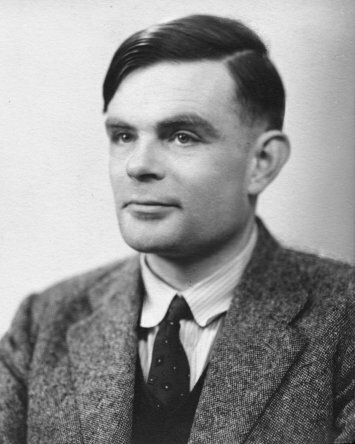 A Turing complete system can calculate anything which is calculable—given enough space and time. except the mechanism cannot reach. to the number you desire. and apply to join the human race. the test will be passed. to see it looking back. of ideology, ice-cold salt water, and steel. before rolling up your sleeves. you could jot down suitable numbers. I love the poem. After a long day and half way through a Bloody Mary, that is about as specific as I'll get, but I love the poem.